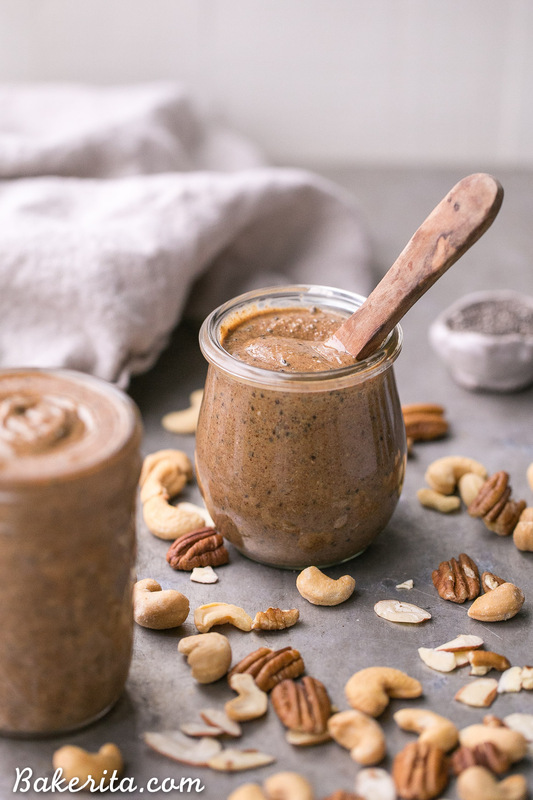 This Super Seed Nut Butter is made with a variety of nuts and seeds, creating a smooth and creamy spread that’s super flavorful and loaded with nutrients. 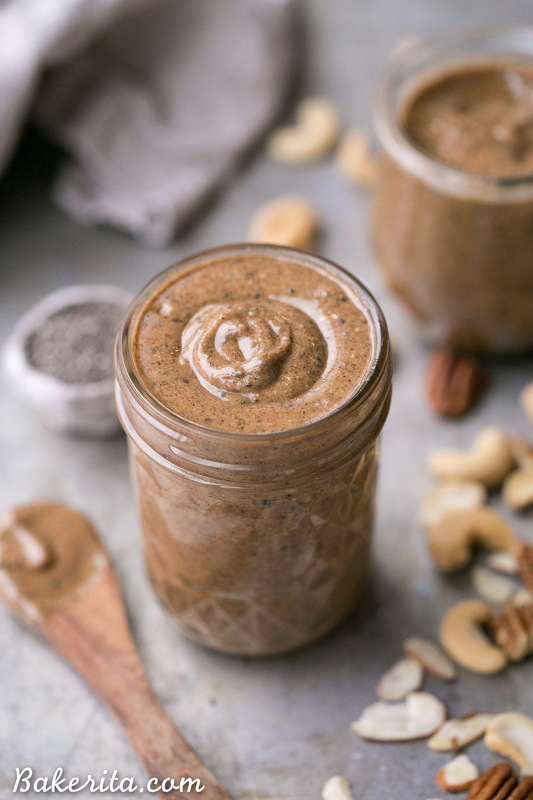 This delicious homemade nut + seed butter comes together quickly in a blender or food processor. You guys probably wouldn’t believe the amount of nut butter that I go through. I’m constantly finishing jars – I’d say that nut butter is one of my main food groups. Slathered on apples is probably the most common way I eat it, but I also devour my various nut butters with bananas, swirled into my oatmeal, dripped on a smoothie bowl, and by the spoonful (no shame). Ever since I did my Whole30, I’ve been loving creating all my own nut butters in my kitchen. I still have lots of my favorite nut butter brands (newly obsessed with Mee Eat Paleo! ), but sometimes I just want to create my own weird flavors and see what goodness I can come up with. I make my nut butters in my Vitamix because my nut butters seriously always come together SO fast (like 2-3 minutes fast), and there’s not as much scraping required as with a food processor, just have to tamper it down a bit with the tamper stick. If you only have a food processor though, or your blender just isn’t high powered enough, you can still definitely make this, it’ll just take a little bit longer. It’s so worth it, though! 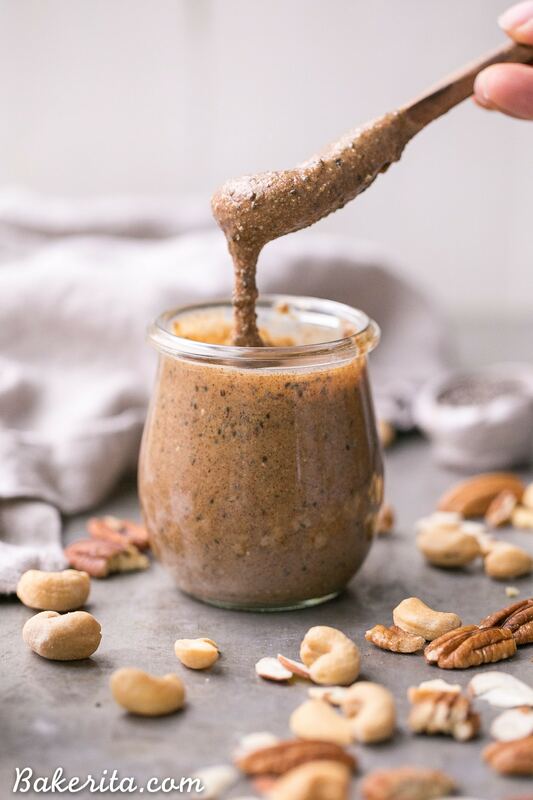 For this super seed nut butter, I wanted to make a mix of a bunch of my favorite nuts and seeds, and it turned out spectacularly delicious. Pecans are some of my favorites and I’m totally obsessed with pecan butter, so naturally they had to be involved. Because they have a high fat content, they help make the nut butter super drippy. Cashews and almonds are the other two nuts I used, because I ❤️ them and they make such luscious, creamy butter. In addition to the nuts, I packed in some sunflower seeds, which blend into a creamy butter with the nuts. I also loaded it up with chia seeds and flax seeds, which add little bits of crunchy texture. Texture is very important to me, so that little bit of crunch from the chia and flax seeds was just the thing to make it perfect. For flavor, I added a TON of cinnamon, and salted to taste. 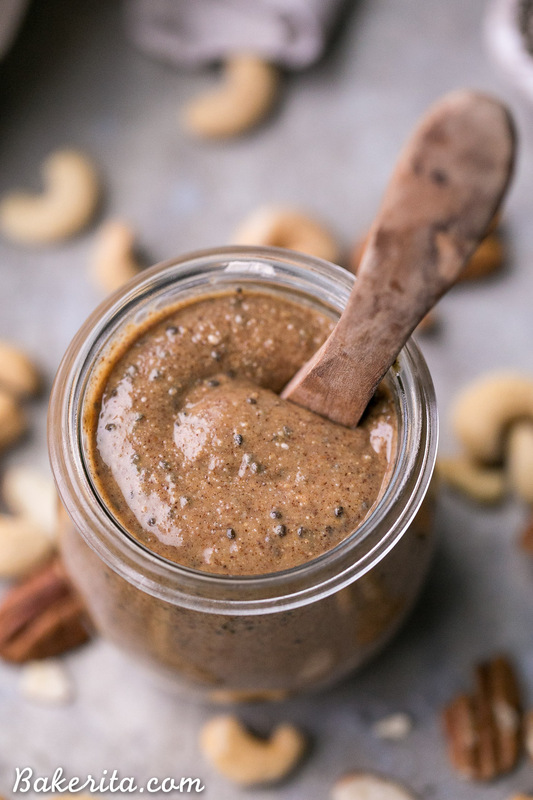 I like my nut butters to have a whole bunch of spice, and because nut butters have so much fat, it takes a lot of spice to get the flavor to come through well. I used more than a tablespoon of cinnamon here, and it was perfect for me. After letting it sit for a day, the flavors have melded and it almost reminds me of a graham cracker with all the cinnamon. So swoon-worthy! After editing the photos of this drippy deliciousness, I was inspired to make another jar…so I’m happily VERY well stocked in super seed nut butter for a while. Off to go have a spoonful – I recommend you make yourself a batch so you can do the same :) enjoy! Combine the pecans, cashews, almonds, and sunflower seeds in your food processor or high-powered blender (I used my Vitamix). Process for about 3-6 minutes, scraping down as necessary. Your time might be shorter if you’re using a high-powered blender - it will take a little bit longer in the food processor and require more scraping down. When the nuts have broken down into a smooth, creamy butter, add the chia seeds, salt, and cinnamon and/or vanilla extract, if you’re using. Process to incorporate, and taste. Adjust add-ins as desired. If it's not blending up as smoothly or thinly as you want, add a little bit of coconut oil here. Transfer to a glass jar or two (like a mason or Weck jar) and store for 2-3 months. I like a lot of cinnamon in my nut butter, so I used a little more than a tablespoon of it. I salted to taste. Also, you can always use toasted nuts if that's your preference! 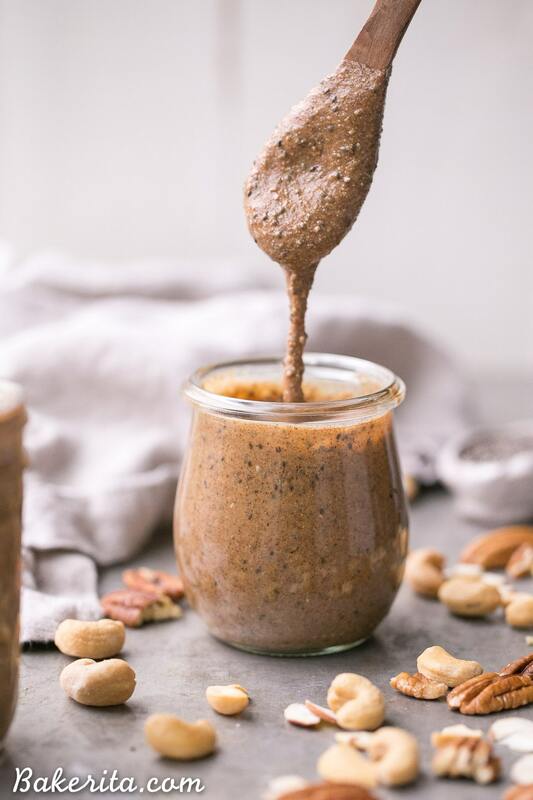 I love a good nut butter and I LOVE all the healthy seeds that you packed into this killer nut butter! This would be insanely good on toast in the morning! I’m right there with you in terms of nut butter addition <3 This reminds me of the new Mixed Nut Butter from Trader Joe's. I wasn't expecting the different consistency (peanut & almond butters are so much more solid) and immediately fell in love with the flavor. 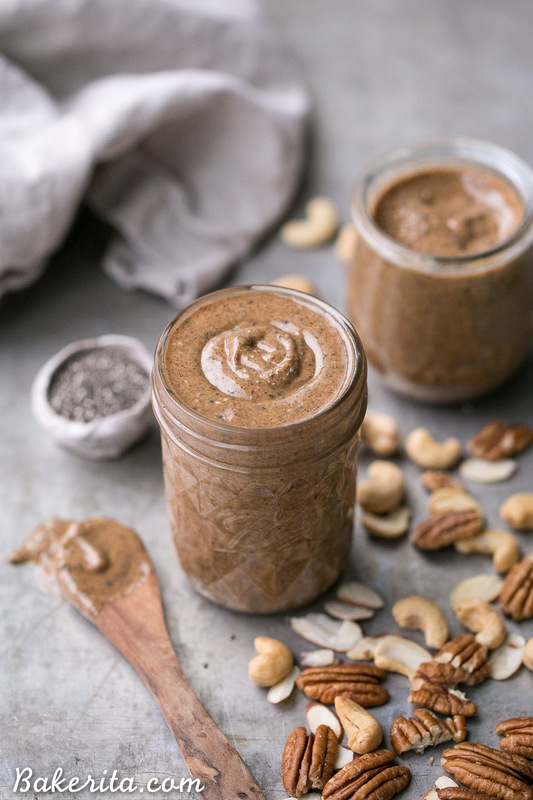 I can't wait to give your recipe a try – because I vow to #NeverRunOutOfNutButter again!! These photos are stunning, Rachel! Omg, and I just want to dive into that butter! Honestly, I eat so much of it myself I’m not sure why I’ve NEVER made it. Yes, you heard that right. I’ve never made my own nut butter. I think I love Trader Joe’s too much, but this super seed batch may be the thing that makes me take the leap! You neeeed to try it Megan! I used to never make my own but gobbled it up so quickly, and now that I make my own I can’t make it often enough :) so fun playing with new flavors, too. Thanks lovely! A nut butter that is loaded with cinnamon and tastes like a graham cracker? Freakin’ SIGN ME UP!!! haha yup nut butter is one of my main food groups as well! This sounds amazing!! I would love a big spoonful right now! We go through so much nut butter! Love this combination of seeds and nuts! We’ll be trying this soon! OMG, this looks amazing! I’m going to make it tomorrow! Question-have you tried toasting the nuts prior to blending? Just wondered if I should give it a shot or if you’ve tried it and don’t recommend it. Hi Maureen – YES, I roasted them the second time I made it and it’s super delicious! Just roast the nuts at 350 for 10-12 minutes or until golden and fragrant, and then let them cool completely before proceeding with the recipe. Enjoy!! YAAASSS!!! Toasted pecans make me swoon! Thank you, Rachel! Wow! Just whipped up a batch, and it is delicious! I did toast the nuts, and added 1 tablespoon of maple syrup, along with the vanilla and cinnamon, and yes, it’s DOES taste like a cinnamon Graham cracker!! Crazy! Wish it would have said to toastthe nuts in the directions. Mine in my vitamix did not turn creamy even with vanilla liquid added. Last nut butter I made I toasted the nusts and it was creamy. I will use this up and try your recipe one more time toasting the nuts. Is there any advantage to soaking the nuts overnight before making the recipe? Hi Tom – actually you wouldn’t want to do that here unless you plan to dehydrate them completely before blending into nut butter. If you just soaked and blended, you wouldn’t get a nut butter but more of a nut paste, because of all the added water, and it wouldn’t be shelf-stable. Hope this helps! You answered my question about dehydrating my soaked nuts before processing. I love all seeds and nuts and nut butters (pecan is my fave, too) but lacking a Vitamix or Blendtec I’ve been afraid to risk a batch of pricey nuts … so thanks for telling me I should be able to do it in my blender or food processor. I’ll have to try pumpkin seeds, though, in my recipe. Love those pepitas.